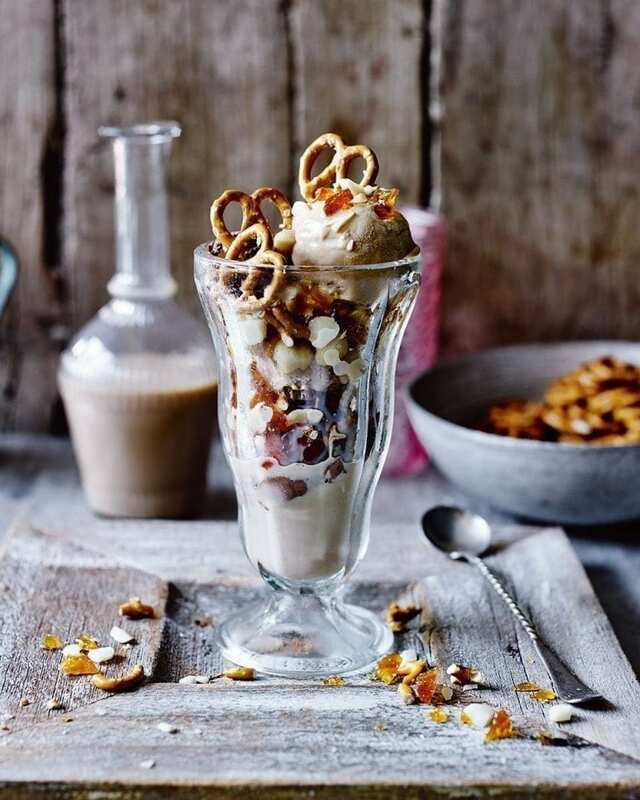 Top your favourite ice cream with pretzels, caramelised macadamias and a good shot of Baileys for an adults-only sundae. To make the caramelised nuts, line a baking tray with non-stick baking paper and put the macadamias in the centre of the tray. Put the sugar into a spotlessly clean frying pan and shake to spread it evenly, then put over a very low heat and leave it alone. In a few minutes it will begin to melt and caramelise. Once most of the sugar crystals have disappeared, drag the melted sugar around with a fork to even out the colour. When the sugar has formed a golden caramel, pour it over the nuts and leave to set until completely firm. Break up the caramel nuts and chop into small chunks using a heavy knife. To assemble the sundaes, layer up scoops of ice cream in sundae or tall glasses with the nuts, a drizzle of Baileys and the crumbled pretzels. Top each sundae with the rest of the Baileys, nuts and a few whole pretzels, then serve. You can use almonds or hazelnuts for this instead of macadamias, or Frangelico or Amarula instead of Baileys. The macadamias will keep in an airtight container for up to 3 days.